Non fiction – paperback; Ebury Press; 484 pages; 2005. I confess that I have never been much of a Piers Morgan fan, after all he’s a (former) tabloid editor and I don’t have that much respect for tabloid newspapers. But now that I’ve read Morgan’s memoirs, which chart his meteoric rise from showbiz reporter to editor of a national newspaper, the Rupert Murdoch-owned News of the World, at the tender age of 28, I have a new-found respect for the man. Despite the obvious arrogance and his tendency towards egomania, he is a formidable and hugely talented editor who has similar editorial values as my own, something I would never have realised without reading this book. (I also admire his fierce anti-war stance.) I came away from The Insider full of admiration (his ingenious ideas for front covers, particularly on The Mirror, astound me with their brilliance) and appreciation. Written in diary form, this difficult-to-put-down book, covers all the major events of the past decade, including Tony Blair becoming Prime Minister, the death of Diana, Princess of Wales, the terrorist attack on New York’s Twin Towers and the outbreak of war in Iraq. 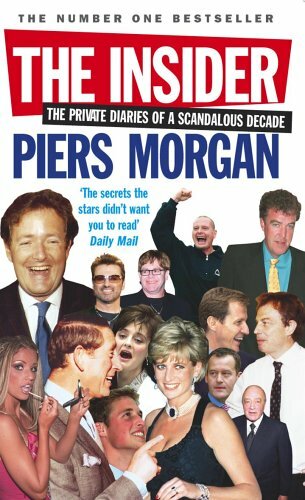 Similarly, it is filled with massive personalities from George Michael to Victoria Beckham, Paula Yates to Paul McCartney — and (rather indiscreetly) reveals tidbits of their lives you would never read about anywhere else. More importantly, this book gives an intriguing glimpse into how the Fourth Estate operates, and often co-operates, with Government, Royalty and Celebrity. The power games and tawdry struggles will have you gasping with shock one minute, killing yourself laughing the next. And it also demonstrates how newspaper staff often pull out all the stops to deliver the big news stories of the day while us mere mortals lead a dull nine-to-five existence. Mind you, Morgan pulls no punches in describing not only the adrenalin rush of his job, but the fierce (and sometimes violent) rivalry between other editors and newspapers in the fight to stay on top in such a cutthroat business. While The Insider has a particularly British slant, it’s a brilliant, fast-paced and entertaining read no matter where you come from. Shocking, scandalous and utterly compulsive, I loved this book. If you are interested in pop culture and/or the media you would be well advised to get your hands on a copy as soon as you possibly can — you won’t be disappointed.